XenonHost Review 2019: Is XenonHost a Good Hosting? Romanian hosting company XenonHost offers SSD-based shared hosting plans with excellent features and high resource allocations. XenonHost is a Romanian web hosting brand of SC Edelweiss SRL, and as such has been providing Romanian-based hosting since 1999. This is not one of the leading providers in Romania, but it does offer a range of plans with some excellent value-adds. Its website is in Romanian only; however, the support pages can be switched between 30 different languages via the built-in Google translate plugin. The Romania-based servers use Intel Quad-Core processors, SSD storage, and Linux operating systems. XenonHost guarantees an average server uptime of 99.5%, which is lower than the industry norm, and – judging by the terms and conditions – there isn’t any credit in the event of excessive downtime. The good news is that the plans all have high resource allocations with unlimited traffic, email accounts, subdomains, FTP accounts, MySQL databases, and addon domains. My only reservation is that the disk space is low, ranging from 500 MB to 2 GB SSD disk space. As well as high resource quotas (apart from the disk space), these plans come with a good range of features for both beginners and advanced users. Beginners get the Softaculous and Fantastico one-click installers, and a free installation of the TrendyTools website builder to help you create your website without coding knowledge. Advanced users have access to PHP, Perl, Python, and Ruby on Rails, as well as Cron jobs and SSH access. All plans come with daily and weekly backups, although these are only for disaster recovery purposes and are not guaranteed. Considering the level of resources and features, the prices are in line with similar companies in Romania and abroad (if not a little cheaper). Also, don’t forget you get a free domain with annual plans. The plans can be purchased on six, twelve, and twenty-four-month terms, with no discounts for longer commitments. You can upgrade or downgrade for free at any time, which is pretty uncommon. Quite a few add-ons are presented at the checkout, which I don’t particularly like, but I can understand this in the context of the otherwise reasonable prices. These add-ons are things like an SSL certificate, SpamExperts email security, and the Weebly website builder. Self-support options are quite varied and include FAQs, tutorials, and an announcements page. Fewer facilities are provided for summoning support from a real human; there is a support ticket submission form but no phone number and no email address unless these are hidden away behind the customer login page. Unfortunately, the live chat was offline during Romanian business hours. So I sent a message via the offline live chat window but received no response for five working days… and counting. XenonHost offers a range of SSD-based hosting plans. You don’t get 24/7 customer support with this budget brand, but you do get affordable, feature-packed plans with some unlimited resource quotas. 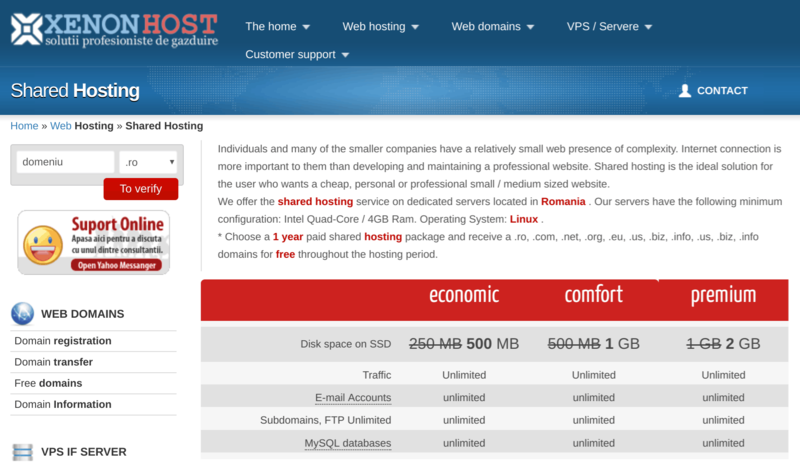 Wondering how XenonHost stacks up against other Web Hosting companies? Enter any other Web Hosting company and we will give you a side-by-side comparison.